Jessica Caponigro. Installation view of “Sing a Funeral Song” at Roman Susan, Winter 2016. In her solo exhibition titled “Sing A Funeral Song,” Jessica Caponigro continues her exploration of the concept of restriction, fluidly translating between her material- and poetry-based practices. A diamond grid handpainted upon the gallery’s storefront window greets visitors, resembling wallpaper but functioning more like a fence as light streams through it and casts a slowly shifting pattern on the gallery walls. As daylight moves across the floor and onto the painting on the adjacent wall, the pattern marks the passage of time and creates an evolving experience. This same work also includes a collection of crafted and found objects, including a row of identical bud vases each with a snapdragon cutting resting in ink. 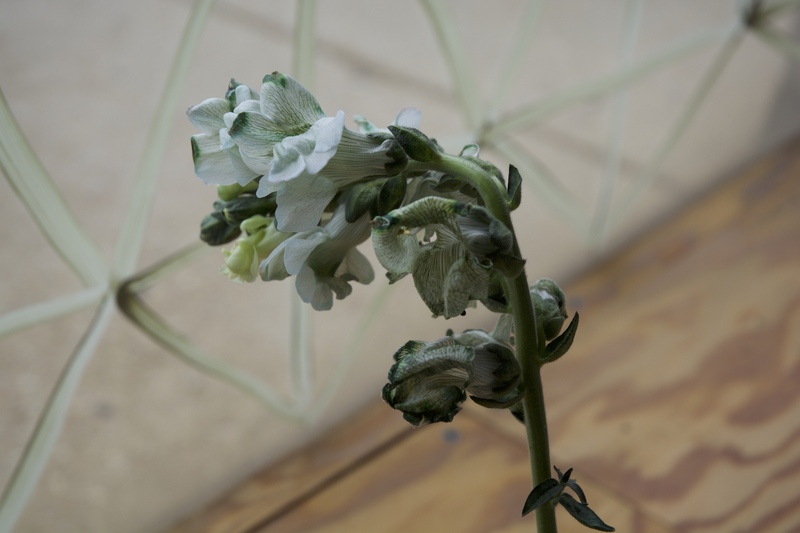 As these slowly fading flowers soak up the dark liquid they wither away, a phenomenon made quicker by placing them in the direct light of a southern facing window. In the early evening hours, a streetlight projects through the handpainted gallery windows, raking across a video included in a piece titled “Architecture Catechism.” The video projection casts an undulating diamond grid upon a wall hung with a faux fur and latex-painted canvas. 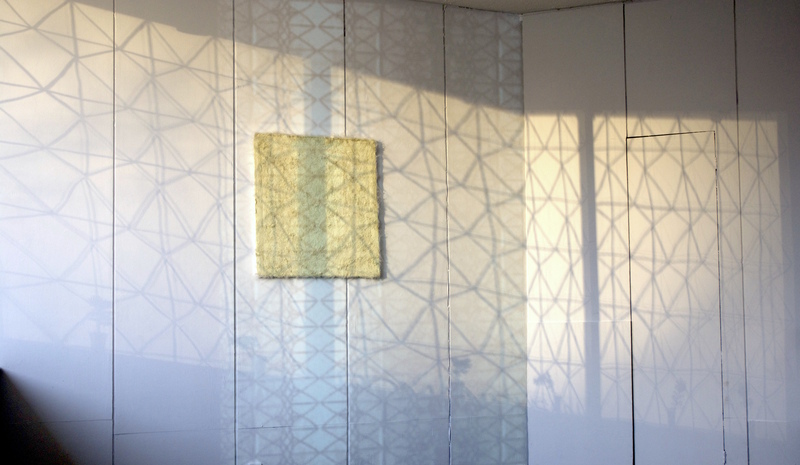 Depending on the time of day, the projected pattern is sometimes outshined by its analog version made by the sun or street light streaming through the window from outside. In “Architecture Catechism,” the canvas fixes the work in a steady form, taking it from the realm of the transient and into the corporeal, functioning perhaps as criticism of the traditional medium or even standing in for a cadaver as the pink, fleshy canvas with frayed and hairy edges evokes the presence of some taxidermied creature. Considering that the exhibition is titled “Sing a Funeral Song” and several works are presented as if they were altars, the entire show can be understood as a visual elegy. But for any exhibition to formidably take on the complicated subject of loss requires extended contemplation by the viewer, a condition that is difficult to achieve in a drop-in gallery setting. And yet, Caponigro elegantly tackles this with her takeaway piece “Mantra (Elimination).” The print, which visitors are invited to pocket, is a reproduction of a Saint Anthony prayer card, but with only the natural elements like rolling hills and his hallmark lilies left in the picture. As the patron saint of lost things and people, the absent Saint Anthony provides just the right means for visitors to continue their contemplation outside the gallery. Jessica Caponigro’s “Sing A Funeral Song” shows through March 26 at Roman Susan, 1224 West Loyola.